����������� A handful of people aided by the American Civil Liberties Union have been fighting since 1989 to force the destruction of a 43-foot cross that graces a memorial to Korean War veterans on property owned by the City of San Diego, Calif. They don't like the Christian symbol and don't care that most people do. ����������� But even though the city thought it sold the Mount Soledad site to a private group, which subsequently spent a million dollars enhancing it for public view, the opponents still are fighting, and vowing not to stop until the cross is gone. ����������� The cross is the centerpiece of a world-famous veterans memorial, and is displayed along with six large granite walls containing 1,600 marble plaques honoring individual veterans of World War II and the Korean War. There also are pillars and pavers honoring various community and veterans groups, as well as a tall flagpole and other secular-related items. ����������� But an avowed atheist and his ACLU lawyers have persisted in complaining that not only is the cross illegally displayed on public property, but the city can't even donate it to a private group because it would still be there. ����������� But most people realize that the government can have a religious display on public property, such as the crosses at Arlington National Cemetery, or this cross, as long as there is also secular content on display. It's wholly within the U.S. Constitution and does not violate the Establishment Clause of the First Amendment, which is meant to prevent government establishment or favoritism of one religion over other religions. ����������� In July 2005, a landslide majority of more than 197,000 San Diegans voted to protect the Mt. Soledad Memorial by transferring jurisdiction to the federal park system. 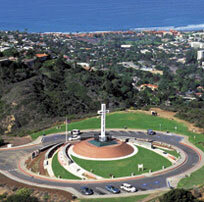 For the latest information on the Mt Soledad Cross controversy search for articles about it on the website of the Thomas More Law Center, www.thomasmore.org and note that the group has started a petition drive to ask the federal government to take over the site by its powers of eminent domain so that the cross display can be protected by federal law.